Jess and I both enjoyed this recipe. It was a pretty simple dish to throw together, and we enjoyed leftovers for lunch the next day. We plan to make this one again soon. We found the recipe in the March 2013 edition of Every Day with Rachael Ray magazine. In a large pot of boiling, salted water, cook the ravioli according to package directions. Drain, reserving 1/2 cup of the cooking water. Meanwhile, in a skillet, melt 1 tablespoon butter over medium heat. Stir in the bread crumbs and season lightly with salt and pepper. Toast until golden, 3 minutes. Transfer to a plate. Wipe out skillet. Return skillet to medium high heat. Add 1 tablespoon of butter and melt. Add mushrooms; season with salt and pepper. Cook, stirring until the mushrooms are tender and browned, about 8 minutes. Add the garlic and cook 1 minute. Add the spinach in handfuls, tossing to wilt. Add the reserved pasta water and the ravioli to the mushrooms and spinach. Stir in remaining 1 tablespoon butter; toss. 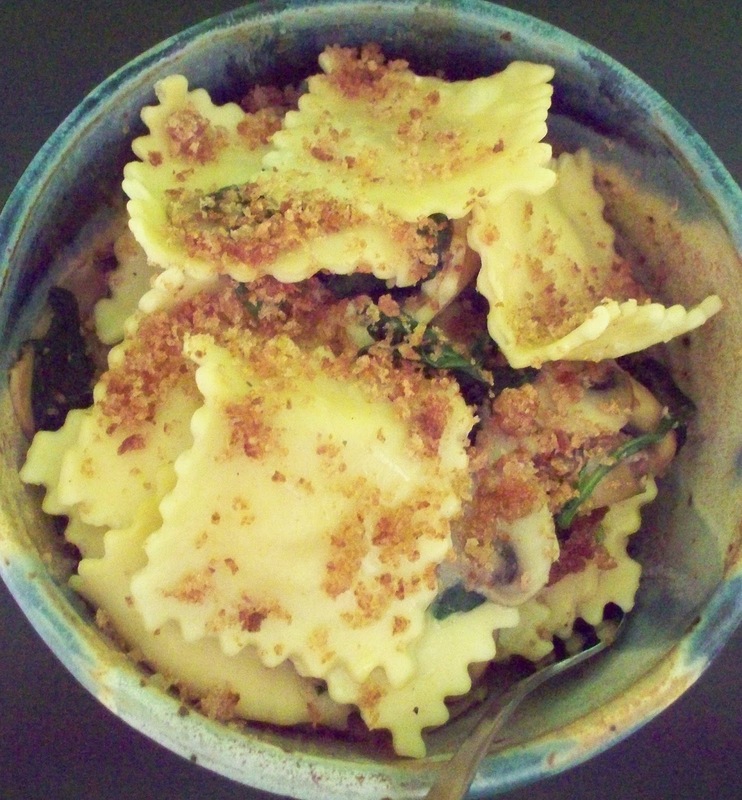 To serve, top the ravioli with bread crumbs and drizzle with EVOO.